This insect is distributed in Indonesia, Formosa, Myanmar and India. Mustard, Cabbage, Cauliflower, Radish, etc. There are five black stripes on the back, and the body has a wrinkle appearance. A full grown larva measures 16-18 mm in length. The adults of these insects are small orange-yellow insects with brown-black markings on the body and have smoky wings with black veins. 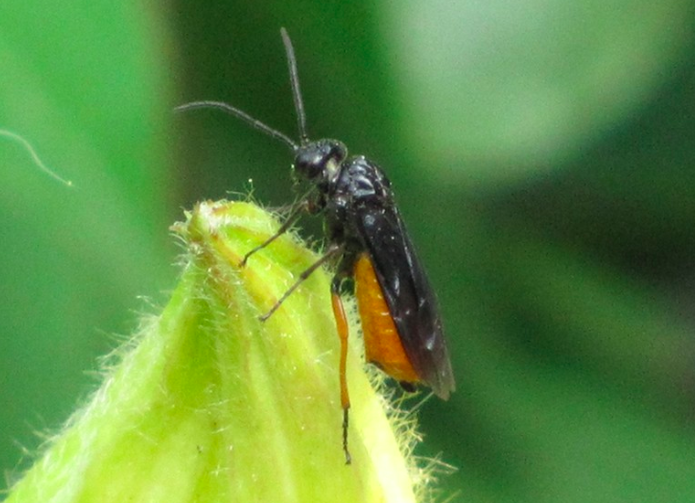 The adults of this insect are small orange-yellow insects with black markings on the body and have smoky wings with black veins. This insect breeds from October to March and ground during summer, the larvae rest in their pupal cocoons. Adults of these insects emerge from these cocoons in the ground during October. Adults live for 2-8 days and during that period, they lay 30-35 eggs singly, in slits made with saw-like ovipositors along the underside of the leaf margins. The eggs hatch in 4-8 days. They remain hidden during the day time and when disturbed fall to the ground and feign death. They pass through seven stages and are full grown in 16-35 days. The full-fed larvae descend the plant and enter the soil to a depth of 25-30 mm. There they pupate in waterproof oval cocoons made of silk and emerge from them as adults in 11-31 days. thus, the life cycle is completed in 31-34 days. The pest completes 2-3 generations from October to March. The grubs alone are destructive. They bite holes into leaves preferring the young growth and skeletonize the leave completely. Although the seedlings succumb; the older plants, when attacked, do not bear seed. Give first irrigation 3-4 weeks after sowing as it reduces tge bug population significantly. Spray one liter of Malathion 50 EC or 625 ml of Endosulphan 35 EC in 150-200 liters of water per ha once in October nad again in March-April. I came across your Mustard Sawfly, S.Name: Athalia lugens. Amazing.